It is a medium-sized deciduous tree growing to 15–18 metres (49–59 ft) tall, with a trunk up to 1 metre (3 ft 3 in) diameter, with brown to gray bark, maturing into hard plates or ridges. The short thick trunk supports long and straggling branches which form a broad and irregular head. The roots are fibrous and branches are brittle. Its juices are watery and bitter. The flowers are 2.5–4 cm across, trumpet shaped, white with yellow spots inside; they grow in panicles of 20-40. In the northern states of the USA, it is a late bloomer, putting forth great panicles of white flowers in June or early in July when the flowers of other trees have mostly faded. These cover the tree so thickly as almost to conceal the full grown leaves. The general effect of the flower cluster is a pure white, but the individual corolla is spotted with purple and gold, and some of these spots are arranged in lines along a ridge, so as to lead directly to the honey sweets within. A single flower when fully expanded is two inches long and an inch and a half wide. It is two-lipped and the lips are lobed, two lobes above and three below, as is not uncommon with such corollas. The flower is perfect, possessing both stamens and pistils; nevertheless, the law of elimination is at work and of the five stamens that we should expect to find, three have aborted, ceased to bear anthers and have become filaments simply. Then, too, the flowers refuse to be self-fertilized. Each flower has its own stamens and its own stigma but the lobes of the stigma remain closed until after the anthers have opened and discharged their pollen; after they have withered and become effete then the stigma opens and invites the wandering bee. The entire Pink family behave in this way. The fruit is a long, thin bean like pod 20–40 cm long and 8–10 mm diameter; it often stays attached to tree during winter. The pod contains numerous flat light brown seeds with two papery wings. Bark: Light brown tinged with red. Branchlets forking regularly by pairs, at first green, shaded with purple and slightly hairy, later gray or yellowish brown, finally reddish brown. Contains tannin. Wood: Light brown, sapwood nearly white; light, soft, coarse-grained and durable in contact with the soil. Winter buds: No terminal bud, uppermost bud is axillary. Minute, globular, deep in the bark. Outer scales fall when spring growth begins, inner scales enlarge with the growing shoot, become green, hairy and sometimes two inches long. Leaves: Opposite, or in threes, simple, six to ten inches long, four to five broad. Broadly ovate, cordate at base, entire, sometimes wavy, acute or acuminate. Feather-veined, midrib and primary veins prominent. Clusters of dark glands, which secrete nectar are found in the axils of the primary veins. They come out of the bud involute, purplish, when full grown are bright green, smooth above, pale green, and downy beneath. When bruised they give a disagreeable odor. They turn dark and fall after the first severe frost. Petioles stout, terete, long. Flowers: June, July. Perfect, white, borne in many-flowered thyrsoid panicles, eight to ten inches long. Pedicels slender, downy. Calyx: Globular and pointed in the bud; finally splitting into two, broadly ovate, entire lobes, green or light purple. Corolla: Campanulate, tube swollen, slightly oblique, two-lipped, five-lobed, the two lobes above smaller than the three below, imbricate in bud; limb spreading, undulate, when fully expanded is an inch and a half wide and nearly two inches long, white, marked on the inner surface with two rows of yellow blotches and in the throat on the lower lobes with purple spots. Stamens: Two, rarely four, inserted near the base of the corolla, introrse, slightly exserted; anthers oblong, two-celled, opening longitudinally; filaments flattened, thread-like. Sterile filaments three, inserted near base of corolla, often rudimentary. Pistil: Ovary superior, two-celled; style long, thread-like, with a two-lipped stigma. Ovules numerous. Fruit: Long slender capsule, nearly cylindrical, two-celled, partition at right angles to the valves. Six to twenty inches long, brown; hangs on the tree all winter, splitting before it falls. Seeds an inch long, one-fourth of an inch wide, silvery gray, winged on each side and ends of wings fringed. A 2003 study by J. Ness showed that when a hawkmoth caterpillar Ceratomia catalpae started eating the leaves of C. bignonoides, the leaves produced extra nectar. The nectar in turn attracted a greater number of bodyguard ants Forelius pruinosus to the damaged leaves, thus giving added protection to the whole plant. In the USA, Catalpa bignonioides is undoubtedly a Southern tree. Europeans first observed the tree growing in the fields of the Cherokee Native American tribes, who called it Catalpa. However, it can flourish in the North as well, and accordingly its original range is somewhat in doubt. 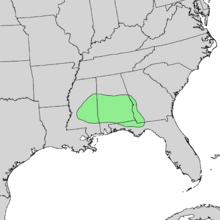 Despite its southern origins, it has been able to grow almost anywhere in the United States and southernmost Canada, and has become widely naturalized outside its restricted native range. It is widely grown as an ornamental tree. 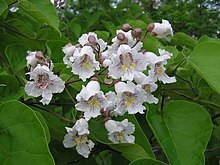 The catalpa has the distinction of bearing some of the showiest flowers of all the American native trees. Its value in this respect has long been recognized and it holds an assured place in the parks and gardens of all temperate countries. It has gained the Royal Horticultural Society's Award of Garden Merit, as has the gold-leafed variety C. bignonioides 'Aurea'. The purple-leaved hybrid C. × erubescens 'Purpurea' syn. C. bignonioides 'Purpurea', has also achieved the award (confirmed 2017). It prefers moist soil and full sun. It is easily raised from seeds which germinate early in the first season. It also multiplies readily from cuttings. The tree is fairly free from fungal diseases and has few insect enemies. The wood is brittle and hard, but does not rot easily; it is used for fence posts and railroad ties. Catalpa bignonioides contains varying levels of iridoid glycosides that deter generalist herbivores, but which are tolerated by and concentrated in Ceratomia catalpae caterpillars. These caterpillars have a longstanding ecological relationship with the tree, and may defoliate a tree three or more times in a summer without killing it. Fishing enthusiasts prize the caterpillars as bait, particularly for catfish, and may freeze them for months after collecting them in the spring. It is one of two parents of the interspecific hybrid tree × Chitalpa tashkentensis. The other parent is Chilopsis linearis. The cross was done by a Russian in Tashkent, Uzbekistan. The hybrid is sterile and at least two crosses exist, 'White Cloud' and 'Pink Dawn'. The genus was common in Europe during the Tertiary period and its fossil remains have been discovered in the Miocene rocks of the Yellowstone River. Wikimedia Commons has media related to Catalpa bignonioides. ^ "Catalpa bignonioides". Germplasm Resources Information Network (GRIN). Agricultural Research Service (ARS), United States Department of Agriculture (USDA). Retrieved 22 December 2017. ^ a b c d e f g h Keeler, Harriet L. (1900). Our Native Trees and How to Identify Them. New York: Charles Scriber's Sons. pp. 225–228. ^ Ness, J. (January 2003). "Catalpa bignonioides alters extrafloral nectar production after herbivory and attracts ant bodyguards". Oecologia. 134 (2): 210–218. doi:10.1007/s00442-002-1110-6. ISSN 0029-8549. PMID 12647162. ^ "RHS Plant Selector - Catalpa bignonioides". Retrieved 13 June 2013. ^ "RHS Plant Selector - Catalpa bignonioides 'Aurea'". Retrieved 13 June 2013. ^ "RHS Plant Selector - Catalpa × erubescens 'Purpurea'". Retrieved 13 June 2013. ^ Lampert, Evan C.; Dyer, Lee A.; Bowers, M. Deane (October 2011). "Chemical Defense Across Three Trophic Levels: Catalpa bignonioides, the Caterpillar Ceratomia catalpae, and its Endoparasitoid Cotesia congregata". Journal of Chemical Ecology. 37 (10): 1063–70. doi:10.1007/s10886-011-0018-1. PMID 21948221. ^ Linda Holliday (17 June 2013). "Leave Those Catalpa Worms Be". Mother Earth News. This page was last edited on 25 November 2018, at 21:29 (UTC).